Tomorrow is the fourth of July and I did a mani just in time for the holiday. I’m really bad at nail art, so I did something that was simple yet festive. This year I’m just staying home with family and enjoying some yummy food. Everything I used is listed below with a pic of my mani! 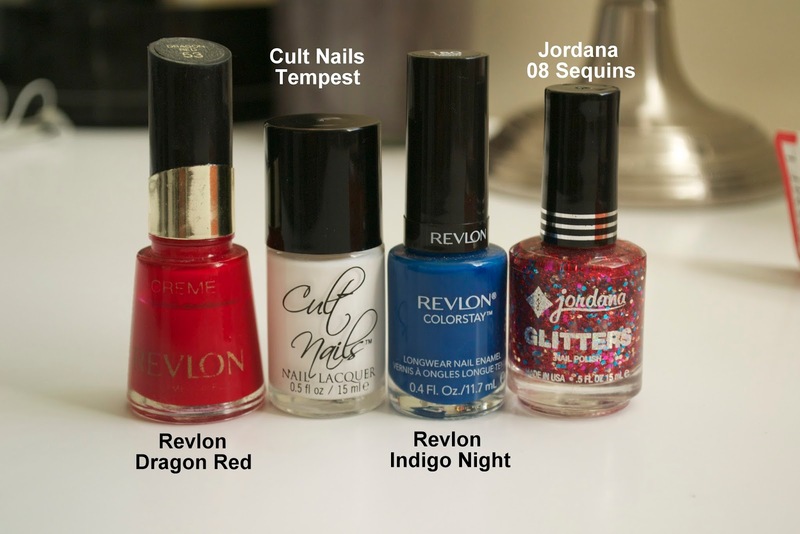 I used: Revlon Dragon Red, Cult Nails Tempest, Revlon Indigo Night, and Jordana 08 Sequins. I’m not sure if the Jordana one actually has a name, this is just what it says on the bottom of mine. The star is just a nail sticker from Kiss Nails. Let me know what you think and I hope you have a fun and safe 4th of July! !